If you use pencils, then I’m pretty sure you use erasers as well. It doesn’t seem quite right to blather on about pencils and not really say much about their important related product. So for a different type of review, here are a few words on my favourite eraser. And you know, looking at the auction websites, I think there are a fair few eraser collectors out there. 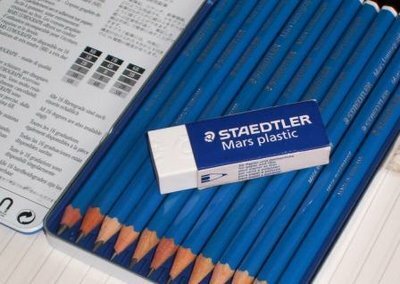 The Staedtler Mars Plastic Eraser 526 50 has been part of my writing equipment for a very long time. In my part of the world it’s pretty much the “everywhere” eraser, - in every stationery and office supply outlet, and every workplace stationery cupboard. Of course down here it’s still often called a rubber. Colour: White eraser, blue and white sleeve. Obviously the most important feature of an eraser is its erasing power. From years of use I can say that the Mars Plastic is up to the jobs I have asked of it. It quickly erases even heavy dark pencil lead. It is less effective with coloured pencil, but that seems to be the way with most erasers. 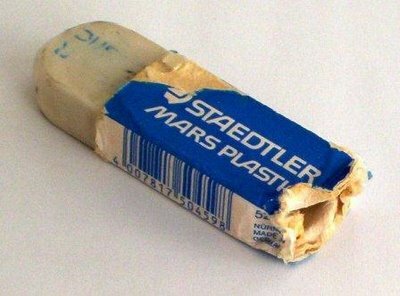 Smearing can be a problem with some erasers but doesn’t seem to be a major issue with Mars Plastic. 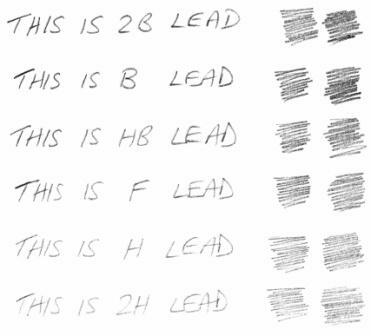 Certainly soft lead grades like 4B and 6B do produce some initial smearing but a few extra swipes removes the smears. Equally importantly it seems very gentle on the paper - you can really be quite vigorous and repetitive in your erasing of a particular spot and the paper remains in good condition. It is a reasonably large eraser which has some good and bad points. On the good side, you can get a firm grip on it which makes things easy if you have a lot of erasing to do, and you can erase an awful lot before you will need to buy a new one. So there’s slightly less need to panic during your exam when you suddenly realise you have to rub out half your wonderful design. On the bad side, whilst it starts out with nice square edges and a square end, you can’t really keep a sharp edge or fine point on this eraser so it is a bit of a blunt instrument. You definitely need an erasing shield if you have some fine erasing to do. Of course chopping the rounded end off the eraser is an option, and I have resorted to this every now and then. The tight fitting sleeve is a nice idea, but doesn’t quite succeed in the real world - it tends to end up looking rather tatty. But then again, I’m not sure I have a better idea to keep the eraser compound clean. Speaking of the compound, as you erase away, the waste does twist itself up into long strands which are easily removed, just like Staedtler claim. They also claim it is good for removing scuff marks from vinyl floors, marks from light switches and wallpaper, cleaning nail files and a whole lot of other things. I can vouch for the first few – but no idea about the nail file! The compound is relatively odourless – I recall “smelly” erasers being very popular when I was a little fellow at primary school. 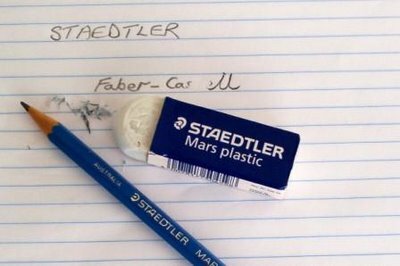 I can’t claim to be an eraser expert, or to have done comparative tests on dozens of different brands, but I think the Mars plastic is a good economical general purpose eraser. 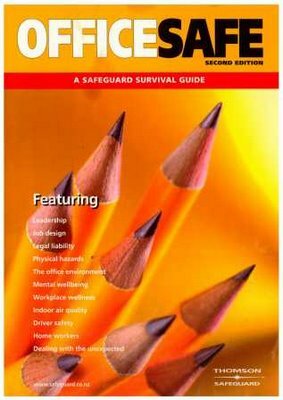 Footnote: Drafts of this review were prepared with a Staedtler (Australia) Pacific 830 grade HB wooden pencil, assisted by Dux 1128-NB sharpener, and of course Staedtler Mars Plastic 526 50 eraser. What is it? 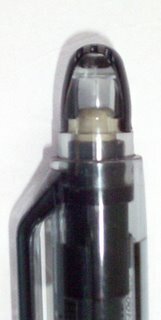 A ‘mechanical pencil cartridge’ that replaces Parker type pen refills and converts the writing instrument from a ballpoint pen to a mechanical pencil. Schmidt is a German company that makes componentry for writing instruments. Their ballpoint refills are sold by a lot of retailers as an economical alternative to the genuine name-brand item. My converters arrived just as pictured, without any instructions. You can also see they are rather different in shape and length to an ordinary Parker ballpoint refill, so exactly how would they fit? They were advertised as allowing you to convert most Parker type pens to pencils. I easily figured out they are a push-top ratchet mechanism and the top pulls off to allow access to the lead chamber. So, first up I grabbed a Parker pen and quickly realised it wasn’t going to work. The spring that fits on the front of the pen refill has to be removed for the converter to fit. My particular Parker’s spring appeared to be permanently affixed inside the pen barrel and I just couldn’t remove it. So then I tried another pen, a non-Parker but one that I could get the spring out of the barrel. But again it was all to no avail. It was actually a twist action pen and I just couldn’t get it to operate the converter mechanism. Well that was two strikes, so I needed to hit a homer before I was three and out. I had another ballpoint that took Parker refills, and I could get the spring out. It all seemed to fit but I just couldn’t get it to work. I then realised that the converter was actually just a fraction too long, and was permanently ‘pushed in’ when the pen was assembled. So by slowly chopping small amounts off the top stem of the converter I found a length that made it work, and Voila! It all woks fine as a standard push top ratchet mechanical pencil, but the lead sleeve is not retractable. So overall, not a bad idea, but a little difficult to get to work in the real world. If you had a pen that you really liked and wanted it to be a pencil, then there’s a chance this converter might just work for you. 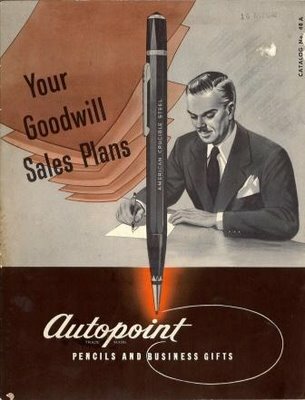 Down here in my part of the world, Autopoint mechanical pencils are something of a rarity, and I don’t know an awful lot about them. A bit of web-surfing over the last few years gives me the impression that they were a major manufacturer in the USA during the middle part of last century, but like many such companies they later fell on hard times. They are sort of still going in one form or another, but seemingly as a mere shadow of their former glory. They have a basic website that offers sales to the public, but they never process my sales orders or answer enquiries. A few online retailers offer some of their products but they are often out of stock, so I don’t really know what’s going on. 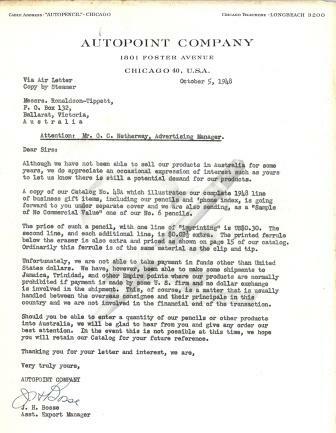 Letter from Autopoint, USA to Ronaldson-Tippett, Australia. Although we have not been able to sell our products in Australia for some years, we do appreciate an occasional expression of interest such as yours to let us know there is still a potential demand for our products. A copy of our Catalog No. 48A which illustrates our complete 1948 line of business gift items, including our pencils and ‘phone index, is going forward to you under separate cover and we are also sending, as a “Sample of No Commercial Value” one of our No. 6 pencils. The price of such a pencil, with one line of “imprinting” is US$0.30. The second line, and each additional line, is $0.02½ extra. The printed ferrule below the eraser is also extra and priced as shown on page 15 of our catalog. Ordinarily this ferrule is of the same material as the clip and tip. Unfortunately, we are not able to take payment in funds other than United States dollars. We have, however, been able to make some shipments to Jamaica, Trinidad, and other Empire points where our products are not normally prohibited if payment is made by some U.S. firm and no dollar exchange is involved in the shipment. This, of course, is a matter that is usually handled between the overseas consignee and their principals in this country and we are not involved in the financial end of the transaction. 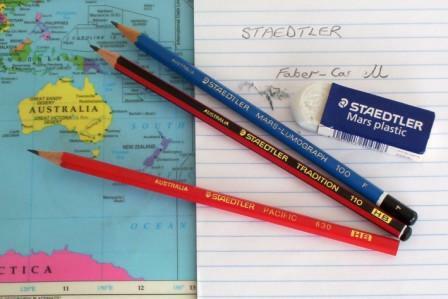 Should you be able to enter a quantity of our pencils or other products into Australia, we will be glad to hear from you and give any order our best attention. In the event this is not possible at this time, we hope you will retain our Catalog for your future reference. 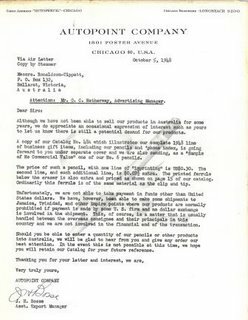 So where does this letter lead me…. Well firstly Ronaldson-Tippett, of Ballarat, Victoria, Australia were manufacturers of tractors, engines, power plant, and other heavy equipment for the agricultural and mining industry. I assume they wanted Autopoint pencils and business items as possible promotional giveaways, rather than as part of the launch of an office supplies company. Secondly there is the reference to “the (British) Empire”. Well that’s not really the right terminology. A case of old habits die hard, as the British Empire had ceased decades before. In 1948 the correct reference should have been ‘British Commonwealth’, but Empire was still used a bit. Back in 1948 I don’t think a New Zealander would mind being incorrectly referred to as part of “the Empire” but I’m not entirely sure about how an Australian would have felt, as they were generally far more distant from the ‘mother country’ than NZ was. Much of even the relatively recent history and personal identity of New Zealand, Australia, and some other Commonwealth countries is so intermingled with that of the United Kingdom its often hard to define when they became separate, perhaps particularly so for New Zealand as arguably the last major colony to ‘emotionally’ separate itself from the UK. Hopefully the reference to ‘Empire’ by a foreigner would have been seen in a flattering light and appeased Australian umbrage at the concept they weren’t independent people but were somehow subjugated by or part of an empire. Thirdly in the paragraph on dealings with “the Empire” there is the reference to prohibited items and schemes to get around export/import problems. At the end of World War Two, the economy of Great Britain was in a terrible state. Years of wartime production priorities and enemy bombing had left many sectors of the economy badly damaged, and it took decades to recover. Some might say Britain never fully recovered. Food rationing didn’t end until 1954, some 9 years after the war ended. On the other hand, much like the USA, Australia and New Zealand emerged from the war with their economic base in good shape. In fact by the early 1950’s New Zealand’s per capita GDP was the second highest in the world…ahh, the good old days, before our long slide into mediocrity. The Australian economy was also doing very well back then too. However all this prosperity masked many structural inefficiencies in the economy. Australia and New Zealand had very restricted protected economies, as alluded to in Autopoints letter. In the mid-1980’s New Zealand went through massive economic reform, transforming from a very restricted economy into a very open one. Back in the 80’s I recall an elderly colleague telling us youngsters how easy we had things these days. I’m talking from a New Zealand perspective here, but I believe things were equally restricted and crazy in Australia. 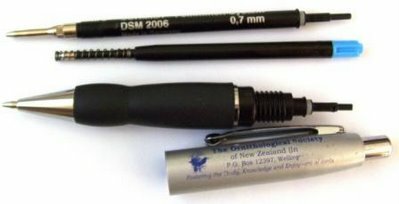 Firstly there were quota restrictions on many items, so there might well have been a limit on the value of mechanical pencils able to be imported into New Zealand (or Australia), and only the quota holder was allowed to do the importation, although they could effectively on-sell the quota to another party. There were tender rounds where you bid to buy the quota the government was offering to sell. So for example the government might have set an annual import quota of “pens and other writing instruments excluding wooden pencils” at say $100,000 worth of imports. Companies then bid for the quota (in $10,000 parcels), allowing them to import writing instruments to the value of the quota they owned. So the winner might pay the government $500 to get quota allowing them to import $10,000 worth of writing instruments. It was effectively an auction so others may have paid more or less for the quota they won. Quota was one thing, but foreign currency restrictions were another. Trading within the Pound currency block was somewhat easier than with real foreigners like the Autopoint Company of Chicago that used funny-money like the US Dollar. Back in the 80’s I was vaguely aware that not all that long before there were still schemes like Autopoint mentioned to get around foreign currency restrictions. Schemes like getting your associated company in another country to buy something and ship it to you, and you paid by shipping them something in return, or they deducted the amount from what they owed you, so you never actually sent any money out of the country. Shades of a barter economy. My colleague explained to us youngsters how back in the 60’s if our company wanted to buy a new imported industrial sewing machine for our clothing factory it was terribly difficult to get one, with things like quota restrictions, import licences, duties, taxes, and currency control all making life difficult. Things were apparently a little easier if it was a replacement for a worn out machine. In those cases a Customs Officer would come out with the new machine and witness the physical destruction (by gas-axe, hammer, etc) of the old machine and thereby somehow approve something that made it all easier. What a drama! I think my colleague was right, so much easier these days without any import quota or currency restrictions. Whoa, all this rambling and I haven’t even opened up the Autopoint catalogue yet! Have to save that for a future post, with less rambling and more true pencil content. So here I am again, way outside my natural comfort zone, writing with a pencil that has a rubber grip and a button ratchet mechanism. That’s two strikes against it before I even start. On the plus side though, it is a Pentel. Lets start out with the overall look of this mechanical pencil. Plastic body, rubber grip, metal pocket clip. To be honest, in black, I think its pretty uninspiring. I haven’t got it in any other colour but perhaps a bright colour might give it a bit of ommph. The colour and shape together just do nothing for me. By Pentels high standards, I don’t think the standard of plastic moulding is very good on this pencil – the part lines and injection points are reasonably obvious. The 3mm metal lead sleeve is suitable for draughting, but it’s not retractable so its not pocket safe. My pencil is 0.5mm lead but other sizes are available. There is an eraser under the plastic top cap - its Pentels standard mid-size rubber eraser so its a reasonable eraser. You pull the eraser out to refill the lead chamber. My pencil came with 5 sticks of lead which is a little bonus compared to the 1 stick you seem to get with most pencils. The pocket clip is a good springy steel clip so its quite functional. The grip section on the Quicker-Clicker is a rubber compound. It’s in the medium to hard range but does have a little bit of ‘give’ under finger pressure, and a little bit of a ‘grippy’ feel so I guess it does improve the grip properties a little bit. I don’t know, maybe it’s just me, but for some reason I just couldn’t get a comfortable grip on this pencil. Something about the grip diameter, it’s shape, the position of the clicker button, etc. I just couldn’t get it right. The first Pentel I haven’t liked? There, I’ve said it, and got it out of my system. My inner torment and dilemma has been reduced. The clicker button is positioned in the rubber grip itself. This means it often gets in the way when you first pick up the pencil, and you have to rotate it around until the clicker is in the ‘right’ place. At least this clicker button forms part of the general contour of the grip section and doesn’t stick out like some mutant growth, but I would definitely prefer the clicker to be higher up on the body, like on the Techniclick, where you can operate it with the joint of your thumb rather than your thumb or fingertip like here. The clicker is quite stiff so it’s not accidentally activated when you pick up the pencil. I suppose some people in a hurry might write with the clicker positioned beneath their finger so they are always ready to advance to lead. But not me. One advantage of the side clicker though is that the lead advance isn’t activated by putting the top cap on or off when you use the eraser. Pentel don’t put much marking on this particular mechanical pencil. 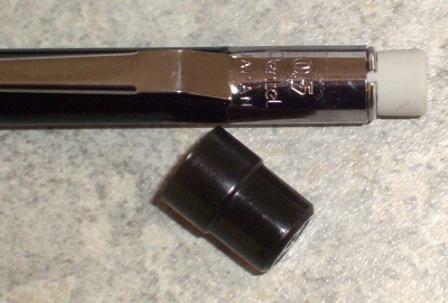 There is “0.5, Pentel, Japan” stamped into the metal pocket clip in big letters and “PD345” in small letters. There is no reference to the name “Quicker-Clicker” on the pencil itself. Best Points – Ummmmm, moving right along. Not So Good Points – The clicker button in the rubber grip, it’s just an uncomfortable combination. Dimensions – Length 148mm, diameter 11mm at widest part of grip. Balance point about 80mm up from the tip. A few months ago Pentel Ain won the inaugural Lead Cup so it’s time to do an official review of Pentel leads. 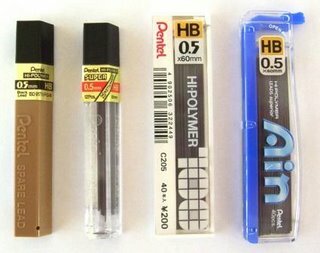 Pentel offer a great variety of graphite leads of many different thickness', hardness grades, quality levels, packaging, etc. For example in ordinary mechanical pencil refill leads they offer 0.3, 0.5, 0.7, 0.9 and 1.3mm thickness leads. In 1.3mm they offer hardness 2B, B, HB and H, but in 0.5mm leads the range of hardness offered expands to 4B through to 6H, including an F grade. They label their apparent quality levels as ‘Hi-Polymer’, ‘Super Hi-Polymer / Ain’, and ‘Premium Hi-Polymer’. Despite the name ‘Premium Hi-Polymer’ it appears that ‘Super Hi-Polymer / Ain’ is their top quality level lead. 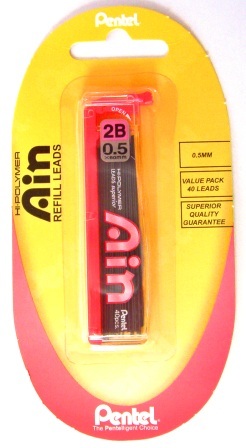 As far as I can tell, Ain is just a marketing brandname, the Super Hi-Polymer leads are sold in a variety of containers, quantities per container (e.g. 12, 30 or 40 leads per container) and so on, some as ‘Super Hi-Polymer’ and some as ‘Ain’. All in all there’s an awful lot of apparent choice. I wasn’t really sure about how to review leads, so I decided to spend a week writing with a selection of different hardness Ain 0.5mm leads. For comparison I also used Pentel Hi-Polymer 0.5mm HB lead. In theory the Ain leads are superior to Hi-Polymer. Well let’s get a few of the technicalities out of the way. Reliving the glory days of The Lead Cup, I put a few sticks of lead to the strength test. It was a clear victory, Ain HB is miles stronger than Hi-Polymer HB, so the cynic in me is wrong, there really must be two different formulations. Right then, what about between the hardness grades of Ain? There was a small but clear difference – as you might suspect, 2H was stronger than 2B. So that’s strength, what about darkness? Just how much difference is there between the hardness grades? Basically I don’t think there is a lot of difference from one grade to the next on the scale, but if you skip a few out then there definitely is a difference in darkness. Anyone could tell 2B from 2H but its pretty difficult spotting the difference between 2B and B. I think they could probably delete every second hardness and not really affect anyone. I recently had some difficulty with the diameters of some 0.7mm leads, so since my micrometer was handy I ran it across these 0.5mm leads. Grades 2B, B, HB, F, H, and 2H of Ain were all in the 0.565 to 0.57mm range, and the Hi-Polymer HB was 0.56mm. Strictly speaking, if you were correctly rounding to one decimal place, these are all 0.6mm leads, not 0.5mm. I must admit I’m rather taken by the Ain packaging. I like the clear sided gently curving container and the bright printed graphics. There appears to be a colour coding system in use for the spine and lever top - varying shades of red for the B grades of lead, greens for the H grades, and blues for the HB and F mid-grades. My containers have quite an array of fine print on the back of them relating to plastic recycling. There is some difference in the container markings, indicating it’s a changing thing at Pentel. The F container has no recycling information on it, but all the others do. Now I’m not much of an expert, but as far as I can tell, the marks indicate they are recyclable, and are in fact made from some recycled material – polypropylene and whatever ‘AS’ is. I am guessing its some sort of acrylic-styrene, but I can’t find any reference to what the code ‘AS’ stands for in the plastics recycling schemes. But then again I don’t read Japanese. There are 40 pieces of 60mm long lead in each Ain container. You flip the top open by pressing down on the lever with your thumb. Then you give the container a bit of a shake to dispense some lead. Actually this is not really the best. Sometimes you have to give it quite a good shake to get some leads out, and you can get one, or 2 or 3 at a time. Putting surplus leads back in can also be a bit fiddly. I get the impression it’s supposed to be a design that dispenses leads individually, but often lets a few others sneak out. Now, what about actually writing with the leads! First up I put on my testing hat and did a blind test on the Hi-Polymer HB and Ain HB. Could I tell a difference when just writing under ordinary circumstances? Well, basically no. 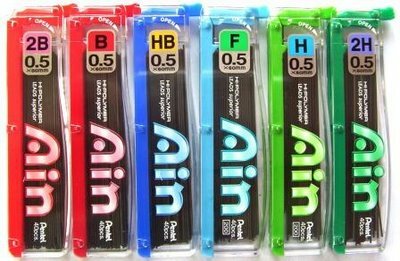 I had Ain in one pencil and Hi-Polymer in another and swapped them around a few times. I couldn’t tell the difference. Ain was of course stronger, it was undefeated in the strength tests of the Lead Cup, but that doesn’t mean Hi-Polymer was weak and breaking all the time, because it wasn’t. 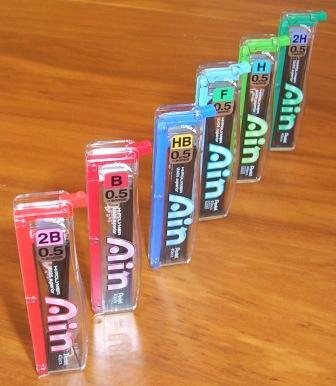 Ain has exceptional strength, but Hi-Polymer is certainly strong enough for normal use. About 10 years ago I did a year long part-time course in quality assurance. I always remember the time we did a class test on Coke vs Pepsi. This is apparently a standard technique in the food industry. You give the test group three samples each – 2 of one thing and 1 of another and ask them to pick the odd one out. So, my class of 20 or so students were each given three little taster cups of cola – 2 were Coke and 1 was Pepsi. I mean how hard could it be? They taste completely different, don’t they? Well, statistically speaking my class couldn’t tell them apart. Pretty much 1/3rd of the class chose sample A as the odd one out, 1/3rd chose B and 1/3rd C. The lecturer said he had never had a class that could tell them apart, so as much as I can’t believe it, it appears there is no difference between Coke and Pepsi to the taste-buds of the general public. Crazy stuff. Now note that I said general public. In my class there were two employees from the local Coca-Cola bottling plant. One worked in the laboratory and the other was a genuine ‘taste-tester’. The lady from the laboratory could easily pick the Pepsi by taste, we all watched as she did the three way test a few times and could immediately choose the odd-one out. Then it was the taste-testers turn. He was of course stunned at how useless we all were, a bunch of morons unable to tell Coke from Pepsi. I kid you not, he could tell them apart by sight from a few metres away. Blindfolded he could tell them apart by listening to them – the different levels of carbonation making different bubble sounds! Blindfolded and fingers in ears he could sniff them and tell them apart by smell. 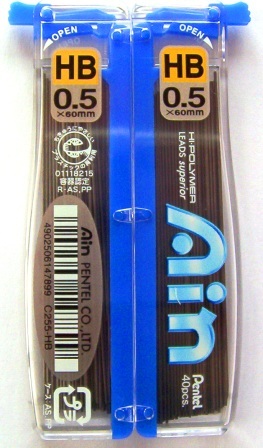 So, I’m sure the lead experts at Pentel can tell Hi-Polymer from Ain in the blink of eye, but as for the rest of us…. Well that’s Hi-Polymer out of the way, what about the different grades of Ain? I spent the rest of the week using two identical pencils, one with Ain HB in it and the other with a different grade – 2H, F or 2B. All the grades are good smooth writing. 2B was slightly smoother than the harder grades, particularly 2H, and if you rotated the pencil to start on a new part of the leads chisel point then you can tell that the harder the grade the more it dug into the paper and took longer to wear down. When I was using the 2H lead I did keep wanting to press harder to darken things up. I put a page of mixed 2H and HB writing through the photocopier and the 2H copies noticeably lighter. Grade 2B definitely wore down faster than HB, so you get more words per stick of lead with HB. I’d guess about a 25% difference. Actually 2B isn’t all that much darker than HB with normal writing, as HB is already quite dark. I did occasionally notice a couple of specks of graphite dust on the page when writing with 2B, and that didn’t happen with the others. Overall I think there is more general difference in 2H to HB than HB to 2B. What about that most unusual of grades, F? It’s really quite hard to tell any difference from HB. I recall a drawing tutor saying that F had the hardness of H and the darkness of HB, but it’s a close call. Office work can be pretty dangerous stuff. Phalanxes of viciously sharp pencils marching the hallways, ready to impale the unsuspecting newbie intern. Or perhaps its all just a propaganda campaign by the ink-lords? 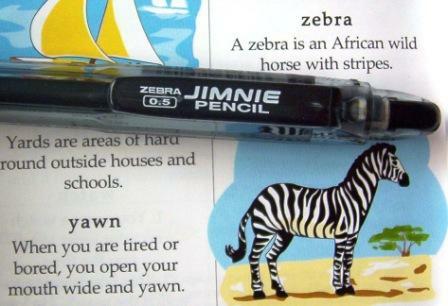 To be honest I’ve never really paid much attention to Zebra’s products. In my part of the world only a small number of their pens and other products, including 2 cheaper models of mechanical pencils, are readily available. I had a few packs of their refill leads because their pencils are usually sold as a set including a pack of refill leads, and so I included them in The Lead Cup. To my surprise they performed quite credibly, so I thought I’d better take another look at their mechanical pencils. The Zebra Jimnie KRM-100 is a fairly standard looking plastic mechanical pencil. It’s a simple colour scheme, basically a black rubber grip and the rest of the body is dark grey tinted transparent plastic. It’s a lightweight pencil, as you would expect with such construction. The pocket clip is an integral moulding and it’s reasonably functional. The black rubber grip has a definite ‘rubber’ feel to it, and you know how I’m not very keen on that. The compound is a medium hardness so there is a bit of give under normal finger pressure. Putting on my objective reviewer hat, I will admit that this rubber does improve the grip properties versus normal plastic. There is a small eraser under the somewhat unusual bullet shaped top cap. The cap reminds me of a robot head from those B-grade 1950’s science fiction films. It sort of has ventilation slits in it, and looks like it’s a two-piece construction with a clear base or body and a tinted U-piece insert. The eraser itself is a rubber compound, and as usual I’m a bit disappointed in it. You can’t put the cap back on without activating the lead advance mechanism. The lead advance mechanism is a standard push-top ratchet. It has a very good solid positive feel to it when you push the top cap. The 4mm metal slightly conical lead sleeve is fully retractable so its pocket safe. Its also a sliding sleeve so will retract whilst writing as the lead wears down. However I wouldn’t recommend that, as it has a terribly scratchy feel across the paper. Push the top cap and advance the lead straight away! Best Points – The rubber grip is good, and for some reason I really like the robot head top cap. Not So Good Points – Nothing much considering the price range, except for those like me who aren’t really rubber grip people. Price Range – Low, but you usually get a pack of Drafix lead refills as well so its quite a good deal. Dimensions – Length 146mm, diameter 9mm across rubber grip. Balance point about 80mm up from the tip. Note: I haven’t seen one, but if you search the web for Zebra Jimnie you basically get the Jimnie Clip which appears to be a similar model but with a document or binder clip. Perhaps the Jimnie has been re-designed and mine is an out-dated variant, even though it’s still on sale down-under?